Italy is a layer cake of history and this is even more true in our area north of Rome known as Etruria, Tuscia or the Viterbese. Follow these itineraries or have us design one for you. The mysterious, smiling Etruscans built a series of cities, founded leagues, painted frescoed tombs and lived the good life here in Tuscia (northern Lazio) over 2,700 years ago. Absolute musts are a visit to the Etruscan museum and necropolis at Tarquinia with its unique painted tombs and the Banditaccia necropolis near Cerveteri noted for its tumuli. The area abounds in Etruscan and Roman sites: Vulci’s bridge and museum, Tuscania, Viterbo’s museum with its wealth of artifacts found in the tombs. 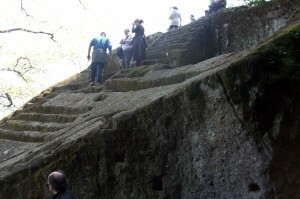 For trekkers there are rock carved cliff tombs at Norchia, Grotta Porcina, Castel d’Asso and San Giuliano near Blera. 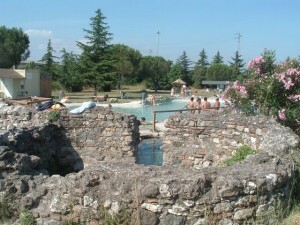 Easily visited sites just 50 kms north of Rome include Sutri’s mysterious amphiteatre. Walk on stretches of ancient Roman roads: the Via Clodia, Via Amerina and via Cassia. During the summer season there are plays, operas and concerts at Ferento, a Roman theatre in the countryside near Viterbo. Walk through ancient Roman cities like Falerii Novi, Volsinii at Bolsena and Ostia Antica near Rome’s airport. Take a dip in the hot pools (Le Masse di San Sisto) near Vetralla or Stigliano (near Tolfa) where Roman soldiers once cured their wounds. 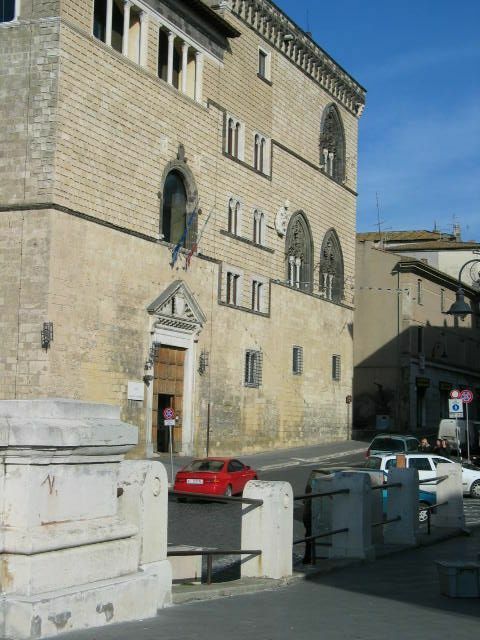 Europe’s best preserved medieval quarter is Viterbo’s San Pellegrino, where the first conclave was held in the Papal Palace in 13th century. The quiet historic centers of Vitorchiano, Barbarano Romano , Civita di Bagnoregio and Tuscania are untouched by time. On the opposite side of the Tiber in the Sabina area visit Otricoli and Casperia , a car-free hamlet. Every hill top town has a fortress, tower or castle to visit. Visit the splendid palaces and gardens of Palazzo Farnese in Caprarola, Villa Lante in Bagnaia, Palazzo Ruspoli in Vignanello, S. Martino al Cimino with its oval town plan, Bracciano’s Orsini-Odescalchi castle, Bomarzo’s Sacred Wood or Monster Park. Every town has several churches, palaces with frescoes and architectural details to admire. Check the blog 50yearsinItaly and our books for more information on these sites and others.